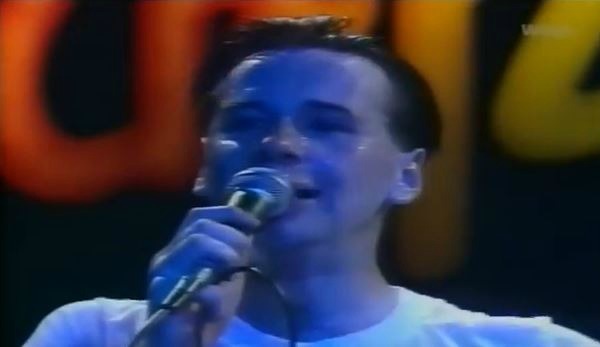 For this week’s installment of Vintage Video we return to that treasure trove of quality early ’80s concert footage, the West German TV show “Rockpalast,” for this New Gold Dream-era performance by Simple Minds filmed on une 6, 1982. Below, via craig floyd, you can watch the full 90-minute performance by Jim Kerr and Co., which even includes the now-dated practice of trotting out your big hit for a second time in the same set. >>which even includes the now-dated practice of trotting out >>your big hit for a second time in the same set. Did a lot of bands used to do this, play the same song twice in a set? That was the only show I can remember where I saw it, but I think I read that EMF did it with “Unbelievable” too … ? And U2 played “Vertigo” twice at one of their Saitama, Japan shows back in ’06. I’ve often thought that if a band was going to do that, the first play should be like a stripped down arrangement that “hints” at the song without totally diving in, to tease the audience and leave them wanting more as you segue into some other song. Then at the end of the set, do the number full on as the big payoff and send ’em home happy. Queen used to do this. They’d open with a really fast, rockin’ version of We Will Rock You, then you got the standard version at the end of the show. Yes on EMF, I saw that tour and they played it twice. U2 on the Boy tour played I Will Follow twice and The Kinks during the One For The Road and Give The People What They Want era did You Really Got Me twice, once instrumental and later the real deal. I saw Christian Death play Heresy twice in 1994. A perfect time in history to see this band! The “New Gold Dream” era caps my favorite phase of SM’s career. Those early albums were much edgier than the arena rock they would soon indulge. I really miss the amazing sound of these analog keyboards. I would also love to get some decently mixed recordings from this tour! Great set! To listen to the bootlegs coming out now form the 2015 Big Music Tour is amazing and then to go back and listen to the old stuff form this era really puts it into perspective!